Following in the footsteps of our success at the Information is Beautiful awards last year with our GEDvis tool, our new FTAvis tool has received Special Mention Honors for Design that Offers Smart Solutions, by the German Design Council. Our new tool which has also been featured in the prestigious www.novumnet.de design magazine, takes critical data and enables users to visually communicate key points of significance. 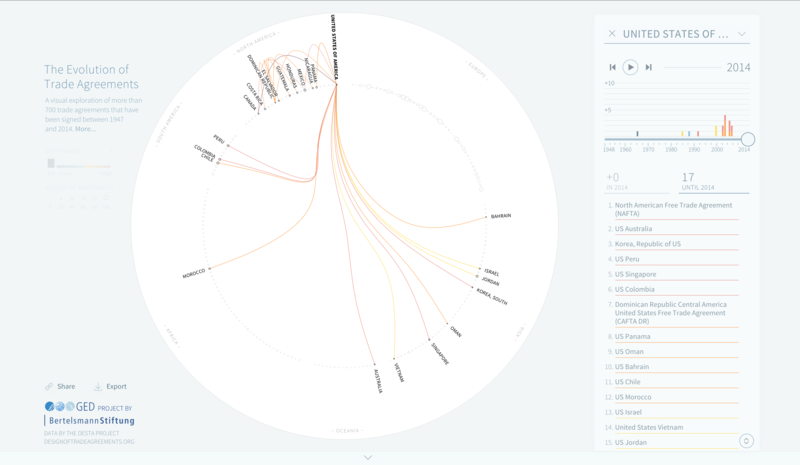 FTA VIS tool visualizes 789 trade agreements from 205 countries over the last 66 years and allows data manipulation to create useful visualizations of the network of connections in international trade. As several large multi-national agreements are currently being negotiated for various parts of the world, this tool is useful to uncover and to understand the complex network of trade agreements across time. Learn more about our FTAvis tool and watch the tutorial below for information on ways you too can use it.